1995 TC2000 RE with a 12 valve 8.3L Cummins, and an MT643 Allison transmission. I'm in the process of gutting. Got the floors/wall panels/ceilings removed. Now I'm going through the wiring. I'm hoping to pull all the emergency window and door (plus rear hatch window and two roof hatch) wires. Is there any reason why this will be a problem? I know the bus will have problems starting possibly if the alarm system is in place but I'm hoping it can be removed. I quick rid bit of advice, as you disconnect stuff, check to see if you can start. If it doesn't, you just narrowed it down to whatever you did last. Makes it easier than months worth of work, then trying to figure what you did during that time frame. I agree, check as you cut wires. I have '97 BB TCFE with 5.9 Cummins 12v 6BTA and had no issues cutting wires to roof hatch & emergency windows. The emergency door may have additional wiring since many buses have ignition interlock so door cannot be locked shut with the little slider bolt lock while its running. Also if the bus is equipped with Child-Check system it could have even more wiring. this is where after shutting off bus the driver has to check for sleeping /hiding kids and push a button or open emergency door/ window in rear of bus or alarm will sound or horn will honk like car alarm. If the emergency door/hatch switches have 2 wires its safe to remove them. If there are 4 there's an interlock. I haven't seen one with 4. What do you do if there are 4 ECCB? IDK, I'd ask someone smarter than I am about how to get around the interlock. But I'd not even want a bus that new to begin with. Mine only had 1 wire and grounded to frame to make alarm sound. best bet is to check for voltage in the number of wires you have, and simply connect or disconnect them to replicate the normal closed emergency door/hatch/window. Here's the wiring I'm confused about. The two emergency doors have this 3 part awesomeness. I have to duct tape the part that used to get depressed by the door latch to start the bus. There is also a larger looking unit that was mounted to the rear of the bus that was for the rear emergency hatch. Duct taped that and the bus starts. 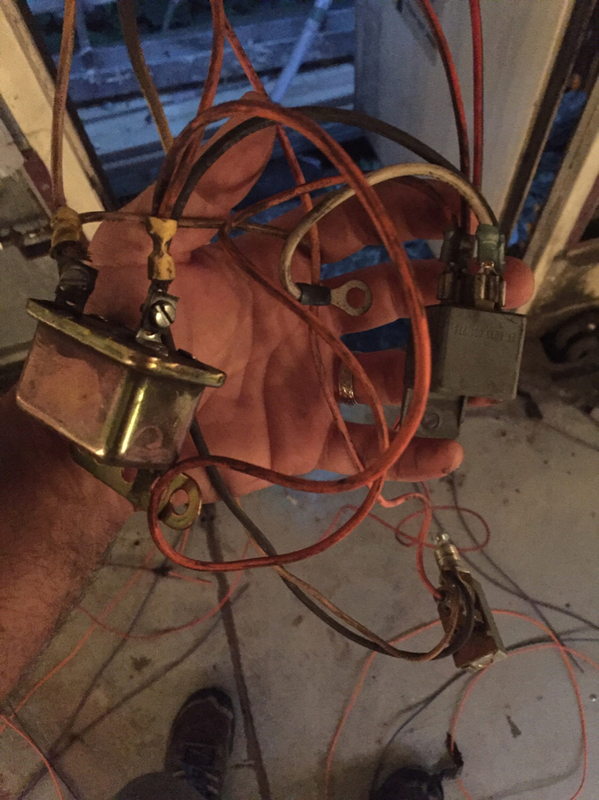 Does anyone know how I can complete the circuit in the wiring panel and then remove these wires/parts? I would make a schematic diagram on paper, then I could tell the sequence of the relay operation for the door switch. most all that stuff can be ash canned.